The Sorel Joan of Arctic boot is certainly a unique boot. The boot combines the function of a typical Sorel boot with a style more commonly found in a stylish, around-town winter boot. This boot essentially is a taller, more stylish, and somewhat less warm, version of the popular Sorel Caribou boot. So if you’re in the market for a warm winter boot that doesn’t have the typical "Sorel look," then the Joan of Arc just might be for you. 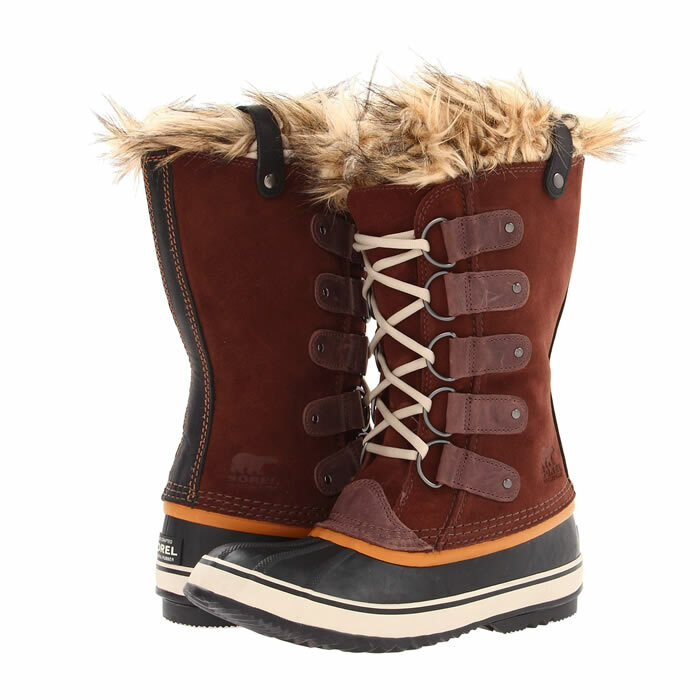 Like most other boots from Sorel, the Joan of Arctic has a rubber bottom. The rubber bottom makes it ideal for using in wet and muddy condition. The upper part of the boot is made from the same type of waterproof leather found in the Sorel Caribou boot. Additionally, the Joan of Arctic is taller than the Sorel Caribou boot. The extra height provides two benefits. One, it looks more stylish, especially with the fuzzy snow cuff and colors available. And second, the extra height makes the Joan of Arctic absolutely ideal for sloshing around in very deep snow and other nasty conditions. The Joan of Arctic is temperature rated to -40 degrees. The inner-boot is removable, allowing for quick drying when it gets wet or sweaty. Overall, for those looking for a tall, stylish and fully functional snow boot, the Joan of Arctic is worth serious consideration. The Joan of Arctic is widely available online, as well as offline in stores located in colder climates. Amazon usually has the full compliment of sizes, styles and colors of the Joan of Arctic boot. Since there are many styles available, the boot has a wide range of prices. But the standard boot usually sells for around The boot is generally priced around $160 - $190. Amazon generally has the best prices available for the Joan of Arctic boot. Snow Cuff : Yes, faux fur. Upper : Waterproof full-grain leather and suede upper. Replaceable Liner? : Yes. Replacement liners available at Amazon. Sizes Available : 6 to 12, whole sizes only. Other Notes : For women only. The upper part of the boot is made from waterproof leather. While this adds weight to the boot, the waterproof leather keeps the leg warm and protected from the elements. For such a tall boat, the Joan of Arctic is relatively light, topping the scales at 2 pounds.